Importance. - The greatest impact of anthracnose is in the urban environment. Reduction of property values, resulting from the decline or death of shade trees, is common. 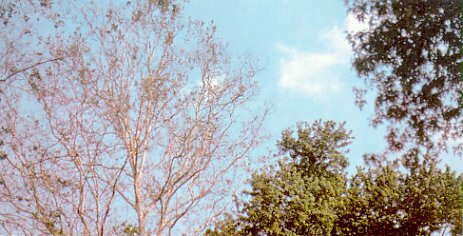 Various hosts are affected, including: sycamore, oak, ash, dogwood, and walnut. Identifying the Fungi. - The fungi which cause anthracnose are different for each host. The fruiting bodies, which occur on twigs and leaves, are distinctive in color and shape. Samples of affected twig and leaf material should be sent to a specialist if this disease is suspected. Identifying the Injury. - Injury usually includes irregular patches of dead leaf tissue (blotches), blackened bases of the leaf stem, cankering of the branch at the base of the leaf stem, and shoot dieback. Cankering is not commonly seen on walnut. 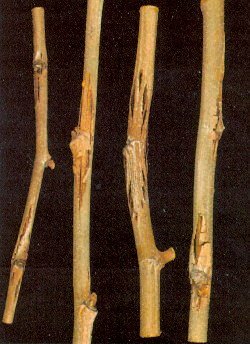 twigs. (Click for detail. JPG 30K). (Click for detail. JPG 41K). Biology. - Infection of oaks and sycamores begins with the leaves. The fungus grows through the veins, down the leaf stem, and into the branch. The fungus survives through the winter in branch canker tissue, and infection of emerging leaves occurs in subsequent years from spores produced on these cankers. The fungi also overwinter in diseased leaves in all hosts. Adverse impact of this disease is directly related to heavy rainfall, low temperature, and low host vigor. Control. - No control is practical in the forest due to the cost. In high value trees, pruning, raking, and burning infected material, coupled with fertilization, improves appearance and may reduce subsequent infection.